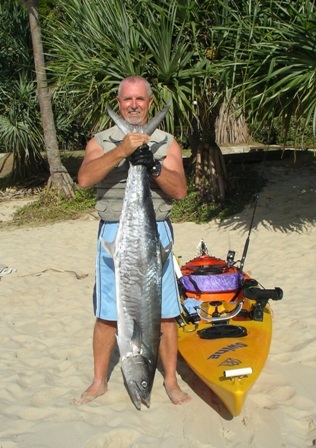 Following up the feature on Offshore Kayak fishing with Noosa's BillyBob Watson last week, today we take a look at kayak fishing in the estuaries and close inshore reefs between Coolum and Currimundi. Local kayaker Paul Anderson gives us an idea on the rigs and techniques needed when competing against boat wakes, jetskiers and rocky outcrops. Paul hails from South Africa and has been a resident on our sunny shores for the past six years. His interests in kayaking stemmed from a strong desire to one day compete in an Olympics in a long distance kayaking event. However, the lure of fishing was far too overpowering, while the strict diet and training regime may have also been a little off-putting. COSTS: The investment of $1800 just over three years ago was what Paul needed to set himself up. This bought him a 3.5meter Ocean Kayak with a self-draining hull. Paul has it decked out with rod holders, a fish finding depth sounder and the essential safety equipment including lifejacket and flares. "I believe the dollars spent on one kayak far outweighs the ongoing costs for a boating angler", Paul stated. WHEN TO GO: The ideal conditions for inshore trips are light sea breezes, relatively small swell and of course fine weather helps! Paul gets up before dusk and heads to one of the bars to access the ocean easily, though Currimundi and Yaroomba are also excellent for launching off the beach or rocks. If the weather comes over windy, hit the local rivers and launch your kayak of any sand bar, boat ramp or shallow bank. TECHNIQUES: Paul enjoys a relaxed approach to his trolling style. Once Paul paddles out past the break, he drops his bait into the water to take advantage of potential hook-ups while paddling to his desired destination. A round trip can be up to 10km of paddling, with a number of stops along the way. The baits are trolled and then drop towards the bottom water when he stops. When Paul commences paddling again the baits climb towards the top water as he gets up speed. Any pelagic species loves targeting this type of moving bait whether inshore or in a tidal river. If using lures, Paul aims to maintain a medium paddling pace, though he is in peak physical fitness, continuous paddling does take it out of you! WHAT BAIT AND RIG: When on the close inshore reefs Paul uses the largest pillies you can buy and rig them up on a long 3x5/0 gang, failing that sea gar or a large slimy mackerel does the trick. Tru-turn hooks ganged together with swivels are ideal if you want to pay a bit more for a better quality rig. Paul attaches this to a short length of single strand wire with a treble at the end. He fishes relatively unweighted but if the fish are holding out in deeper water - place a size 2 ball sinker 1 meter above the hook rig or use a weighted first hook. 30Lb mono is mainly used by Paul or wire braid when the fish are thick. Braid does help in getting the lures or bait down to a deeper depth as well. If you do become caught up, simply turn around and paddle back to where you just came from. As you are only going a few knots, it is far easier to retrieve line which may be caught in rocks or reef than if you were in a heavy boat which takes a lot longer to stop. If you are going to use a sounder, don't try to follow schools of fish like tailor or tuna for example - instead consider where the birds are working and look for the schools of bait on the sounder as that is where the schools of fish are usually headed. No matter how athletic you are - you must still learn to paddle confidently in the river before you even think about punching through a decent swell on your way to the local reefs. A few hours paddling on the ocean can leave you dehydrated - so make sure you have plenty of water onboard during a trip. "The beauty of kayaking is you get into a hunter gatherer mode - and simply allow the spirit of adventure takes over", says Paul. NOOSA: Sweetlip, parrot and maori cod at Sunshine and North reefs. In the river; plenty of jacks showing up after the wet weather - predominantly between the lakes and around the Sheraton Bridge, quality bream have been in the deeper holes near the river mouth, flathead taking prawn lures along the shallow banks in the lower reaches and a few trevally in Woods Bay. 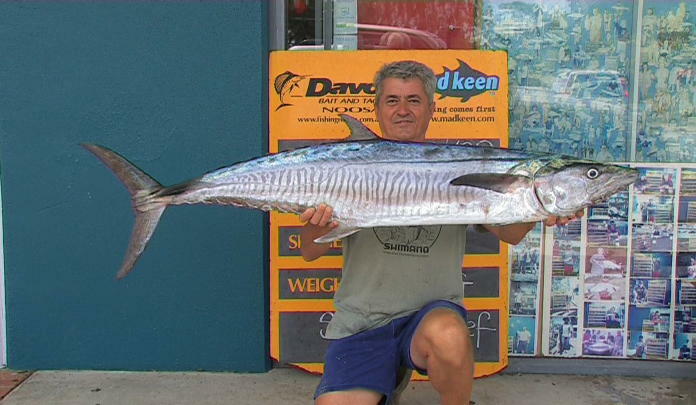 MAROOCHYDORE: A report of an 18kg spanish mackerel caught at the Outer Gneerings on Wednesday morning. Quality bream under the Motorway and off the bank at Yinni Street early on. GT's to 1.4kg on RMG scorpion lures between Chambers Island and the Cod Hole. Flathead and average trevally along the Bli Bli stretch. KAWANA: Good dart, bream and withing just south of Pt Cartwright. In the river; plenty of mud crabs on the move throughout the upper reaches, mangrove jack in the upper reaches and canals, best around McKenzies bridge, golden and giant trevally on lures along the La Balsa Park stretch. CALOUNDRA: School jew from the mouth of Bells Creek and in the deeper channels. Trevally and bream at dawn and dusk along The Boardwalk. Good crabs in the creeks that lead into the passage. A 5kg spotty mackerel and 4.4kg long tail tuna caught trolling large gold shallow diving minnow lure (the tuna) and a large pilly on a set of 5/0 tru turn gangs at the 30cm mark off Sunshine Reef. This 4kg spotty mackerel took a sea gar rigged on an un weighed set of 5/0 tru turn gangs being trolled about 1km off Coolum rocks. This 7kg Spaniard took a large slimy mackerel rigged on a weighed trolling rig being trolled past the bait schools around Sunshine reef. 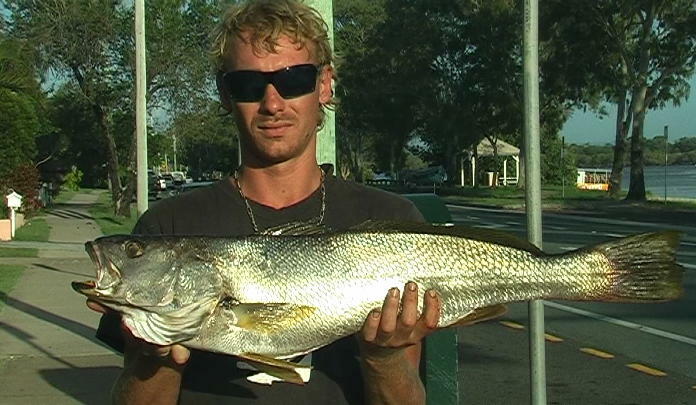 John Hopcott fished with a small strip of mullet in the Maroochy River Cod for this 2kg giant trevally. 'YAK' FISHING - THE REAL TEST OF MAN AGAINST FISH! As the temperatures slowly drop over the next month or two, it is much more likely for fitness to be included in your daily routine – minus that uncomfortable overheating feeling. The thing I hate about summer is the stifling heat and humidity - making me sweat more than when the wife was quite late walking up the aisle at our wedding (parking issue apparently)! Some anglers feel like they are already getting a workout just by casting and retrieving, or winding up the winch to get the boat back on the trailer. So why don’t we take a leaf out of the Kayak Angler’s book and combine our passion for fishing with the skill of paddling to work up a big enough sweat so we can drink a few well deserved beers afterwards – 100% guilt free! Kayaking has long been a mode of transport, used for hunting, fishing, surfing and it’s even an Olympic sport. Modern day sea-faring kayaks are molded from lightweight polyethylene and can be fitted out with just about anything that a boat can. If you are on a budget and buying a boat is beyond your reach –why not get a kayak. Unlike a boat – it can easily go on your roof-racks and you won’t even need to register it! This week kayak angler extraordinaire, Bill (Billy-Bob) Watson shares some tips on the great sport of offshore ‘yak fishing’ at Noosa. Some of you may know Bill by reading his fishing reports for the Noosa area on www.fishingnoosa.com.au or have seen him filming fish catches for the Local Seven News at Davo’s Bait and Tackle. 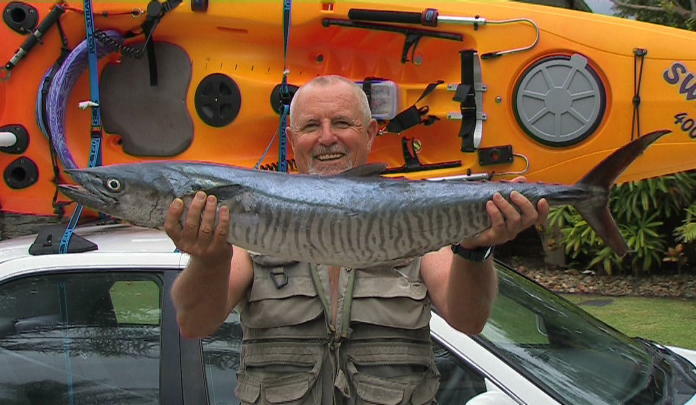 Bill and his kayak are also semi-permanent fixture in Laguna Bay, especially when the mackerel are on. Bill began ‘yak fishing’ nine years ago in his hometown of Noosa and at the time he was in a serious minority group. Very few anglers were willing to venture offshore to chase the big fish. Like many kayaking anglers, Bill began trialing the sport in the local rivers and lakes in a standard kayak. However, his passion for seeking out Laguna Bay close reefs saw him upgrade to a sit-on-top style surf kayak. For calm water work, Bill says the basic requirements for a good fishing 'yak' are; good primary and secondary stability, ample storage space and plenty of relatively flush upper deck area to mount accessories such as rod holders, landing nets, lip grippers and other specialised tackle. “Ideally, a good offshore fishing kayak will reasonably quick under paddle but stable enough to allow you to drag a large fish on board. ThePerception Swing Angler model that I use for reef work is 4m long and has a low profile on the water which means it is not badly affected by cross winds”. Typically, with a quality touring paddle, it has a comfortable paddle/cruise speed of roughly 4 knots. A good troll speed is 2.5 to 3 knots so it can be quite a relaxing exercise routine. The Swing has a front storage hatch with the capacity to take a 13kg mackerel or tuna. Anything above that size (biggest to date so far: 23kg) can be strapped into a specially designed 'fish cradle' which is mounted just before the front hatch entry. Smaller fish like snapper or school mackerel can be easily accommodated in the rear 'tank well'. The Swing has a generous cockpit area and a comfortable foam seat and back rest which is important as I'm often on the water for four or five hours at a time. How far does Bill go in his kayak? “I will, at times, paddle up to 7 or 8km from shore and am comfortable in doing this. As a precaution, though, I carry an EPIRB, day flares and wear a quality PFD at all times. The depth of water I work in is between 20 metres and 35 metres and in my experience few reef fish (up to about 6 kg) present much of a challenge at this depth. Once they’re hooked, they can be played and brought on board. When asked what the main advantages in fishing from a kayak, Bill replied: “You can use lighter tackle as the kayak can go with the fish when it first strikes and runs. This means it's almost impossible to get spooled out or busted off which is a common problem for many boat based anglers. My heaviest outfit is a 6kg-8kg rod paired with a Shimano Baitrunner 4500 reel loaded with 20lb braid”. “I don’t bottom bash or burley up. All my kayak fishing is based around ‘paddle trolling’ so I’m on the move most of the time. I do it for the exercise so am always happy to clock up three or four hours of paddling. Catching a fish or two into the bargain is simply a bonus”. Bill is an extraordinary angler and just hearing his story has made me aspire to one day take up the challenge of ‘yak’ fishing. 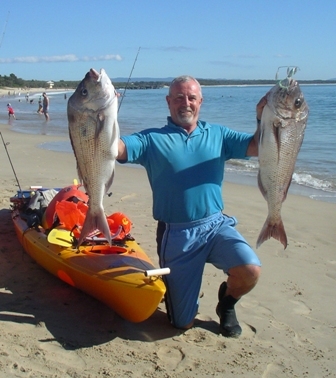 For more info on Billybob's fishing kayaks, check out: www.fishingnoosa.com.au Or call him on: (07) 5474 0628. 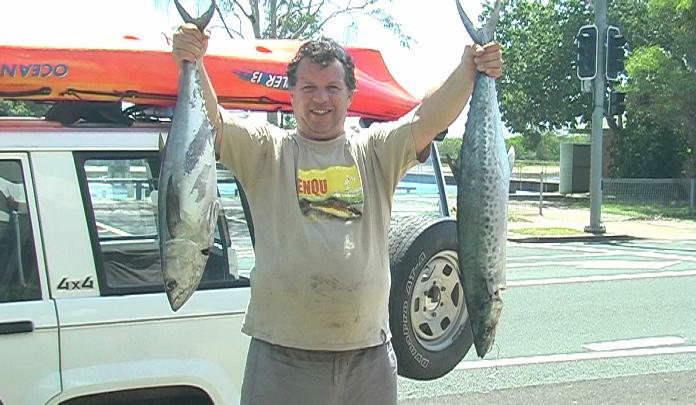 Next weeks article will look at estuary and close inshore kayak fishing in Maroochydore with local angler Paul Anderson. 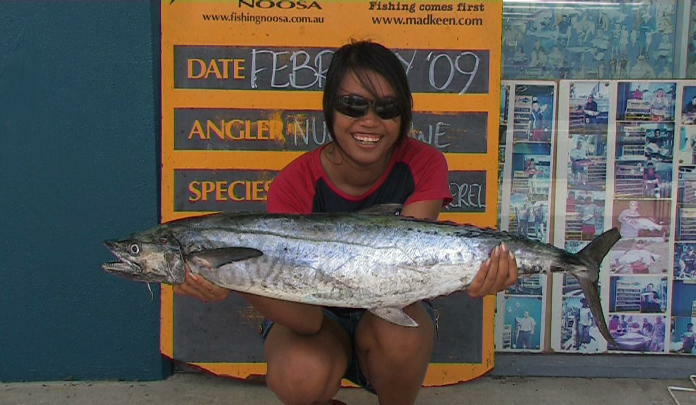 Noosa: Try fishing around the dirty water in Laguna Bay for mackerel and tuna. Trevally in Woods Bay and around Munna bridge on the top of the tide. Flathead and whiting throughout the lower reaches. A few good bream along the Tewantin stretch. Maroochy: The sand bags at the river mouth is where to go on high tide for most species. Bream, cod and flathead have been caught at Yinni Street on high tide. Scattered catches of bream in the deeper holes and channels in the lower reachss. A few mud crabs to 1kg in Eudlo Creek and Bli Bli reach. 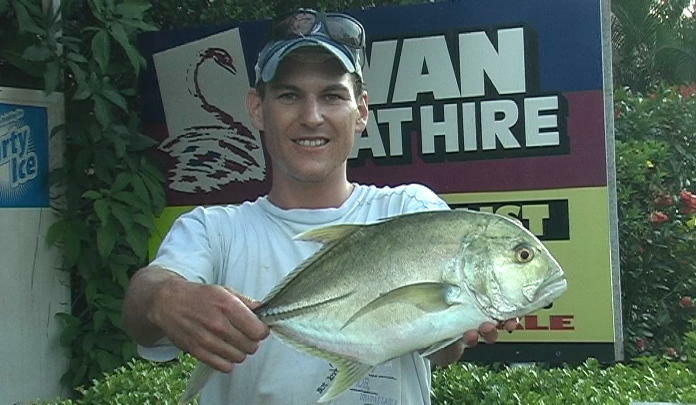 Kawana: Whiting, flathead and bream in the lower reaches, best in the Sand Basin. Whiting, trevally and the odd jack above McKenzie’s Bridge. Mud crabs in Mountain Creek. Caloundra:Trevally and flathead in Pelican Waters canals. Quality bream and small trevally from the Boardwalk and at the creek entrances. 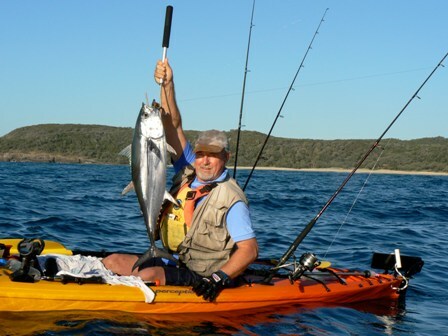 Luxury afloat: Billybob makes gaffing this tuna look easy in his well fitted-out Perception Swing kayak. Bill with a 19.5kg spanish mackerel from Laguna Bay. These snapper would have taken some work to land! Bill smiles from ear to ear with this prized catch. 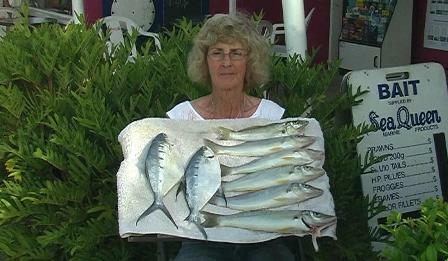 Pauline Tilgals fished Teewah beach before the strong wind hit and was rewarded with these big dart and whiting. Dart are the most fun you can have in the surf with light line. Swallowtail dart can be caught year round in SE QLD waters and are definitely a key bread and butter species for amateur surf fishing anglers. These fish are built for surf beaches with their flattened streamline body and large swallow tail allowing them to maneuver through the waves with ease. When on their side they can even swim out of about 5cm of water at times. The deep narrow shape of the dart also allows them to put up a large amount of resistance against the angler who is fighting them. As they turn side on in the surf it can be a quality game of tug of war, in between waves washing the fish forwards. This is when anglers need to wind rapidly when the fish is just in front of a wave and use the white wash and surge to your advantage. When the fish is behind a wave just play it a bit until the next wave pushes in. Dart are gutsy and will consume almost any bait that is thrown in front of them, but live sand worms and pipis are the best bet and these can be collect for free from the beach. I have found pipis are too soft when the dart are in big schools and the baits are ripped off the hook too easily. To increase their durability try rubbing sea salt onto them and after a couple of hours they will hold on nicely. Cut up pilchards, peeled prawns, whitebait and small strips of mullet also work well on dart. Soft plastics are a handy product to keep in your tackle box for when the worms and pipis are playing hard to get. We often use the Gulp Sand Worm and mimic a live worm on a long shank hook with a running sinker rig; they wash around like the real thing in the surf, producing good hook up rates. Metal slugs are another good thing to use on dart. When dart are feeding on the same bait that tailor are the surf, it is well worth retrieving a small metal slug through the surf at a medium pace. River2sea Sea Rock 14-25 or Surecatch Knight 20-40g have produce quality dart on recent trips. You can literally use any rod and reel combo that has the capability to cast into the bite zone of the surf for dart. This zone can vary from a hole in close, sand banks or a gutter out the back line. On a very recent trip up the beach, we were using 13ft 6inch Wilson Seacoaster rods paired with an Alvey 650B for bigger baits. However, the dart were on in good numbers so we pulled out the 10ft 6inch Heritage rod with an Alvey from the 500 - 625 range. There are plenty of small dart in the surf gutters on any given day and all day long, but the better quality fish show up at dawn and dusk, shortly after beer o'clock normally! The best bet is to hit the beach between 7am - 10:30am and after 3pm through to sundown over the coming months until Winter. Dart love to feed in the whitewater so try to find a good sand bank, if you find a deeper gutter or hole in close, cast over the bank and then allow the waves to push it into the deep water - exactly where the fish should be! It pays to bleed and ice the dart soon after capture if you plan to eat them. I love fresh fish caught that day, dart especially. I just fillet them straight up and throw them onto the barbeque that night! NOOSA: Coral trout to 4kg, spanish mackerel, quality snapper and parrot on Sunshine Reef. Northern Blue fin and Yellow fin tuna just out from the Noosa bar. Plenty of spotty mackerel on metal lures on Jew shoal and Little Hauls. Flathead in the 1st lake on whitebait and in between the lakes on deep divers. Mangrove jack overnight in Woods Bay. MAROOCHYDORE: Whiting around the 26cm mark from the bli bli channel markers. Grunter bream to 42cm from the wetland stretch. Mangrove jack in Twin waters Canals and up Petrie Creek. Tailor in the bar at dusk. Mud crabs throughout the middle reaches. KAWANA: Plenty of good spotty mackerel around Currimundi Reef. Long tail tuna to 10kg from Point Cartwright to Currimundi. Flathead and whiting in the sand basin. Big mangrove jack in Kawana Waters Weir. 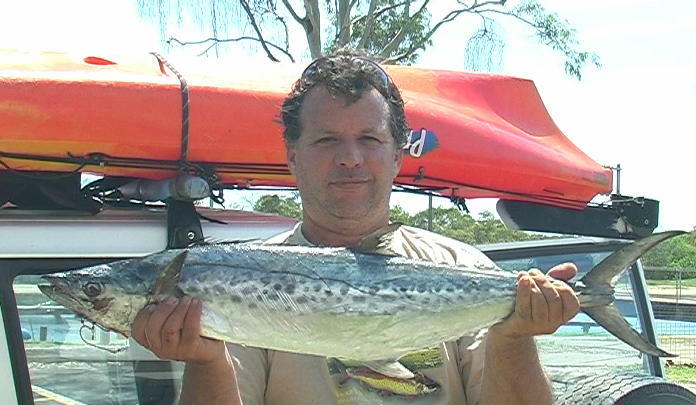 CALOUNDRA: Spanish and spotty mackerel on the 12 mile. Mangrove jacks in Currimundi Lake and Pelican waters Canals. On a recent trip to Teewah my father in law Kevin, my brother in law Ross and myself caught a feed of dart in a nice gutter with plenty of white water late one afternoon using live sand worms. This week the Laguna Bay and the stretch south of Mooloolaba have come alive with schools of tuna feeding on small baitfish. Jon Heales was trolling a halco laser pro when this 4.5kg yellow fin tuna smashed it on Sunshine Reef. 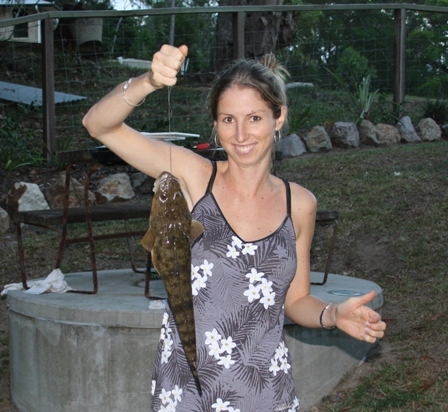 Emily Armstrong is at it again fishing in the middle reaches of the Maroochy River for this pan sized flathead. THE FISH DREAMS ARE MADE OF.....SPANISH MACKEREL! The biggest, the best, the fastest and meanest mackerel of them all brings angler to their knees just thinking about them. This fish can peel hundreds of meters off your reel, causing your drag to smoke on the first run. It is an awesome feeling watching the line peel from your reel at a great rate of knots, with the drag screaming, not knowing when the fish will slow up and that there may be the possibility of getting spooled as the fish heads for the horizon. The smaller mackerel definitely don't go as hard; unless fished on light line, but the 17kg and heavier specimens go like the clappers on standard 10kg set ups - especially if you hook one while at anchor. Spaniard numbers on the Sunshine Coast are at the highest they have been all season so far. They should continue to feed in our waters right throughout autumn, when the smaller fish move on, leaving the big rogue fish throughout winter. At this time of the year you could hit fish any size between 4-25kg, so it pays to troll several different sized baits or lures. Live and dead baits should be trolled along with the outboard just in forward gear, so that the bait swims straight. Lures can be dragged along quicker: 4-10 knots through prominent area. These include areas that birds are working, schools of fish feeding, pinnacles, bombies and dense bait schools showing up on the sounder. Spanish mackerel will often feed in or on the out skirts of schooled up tuna or other mackerel species. Like most species of fish early morning and late afternoon are the key ‘hot bite' times. Spaniards love to feed well between sunup and mid morning when there is enough light for them to ambush bait readily. Live slimy mackerel, yakka, bonito, frigate mac tuna and wolf herring. Good quality frozen bonito, tailor, slimy mackerel, gar, pike and large pilchards. No5 -No7 single strand pre straightened wire, large trebles or heavy gauge single hooks and small black rolling swivels for live or dead baits. A length of single strand with a small black rolling swivel and small black coastlock snap to match the lure. Single strand is the best wire to use because it doesn't vibrate through the water as much as multi strand. Spanish mackerel are excellent fighting fish and really give the angler a run for their money. They feed close enough to the coastline making them are readily available to all anglers, whether you own a kayak or a big ocean-going vessel. With better fighting capabilities, dashing looks and those super-healthy Omega 3 oils present in their flesh - why wouldn't you chase a Spaniard? Michael Delaware was happy with this succulent 4.5kg jew caught at the Cod Hole. 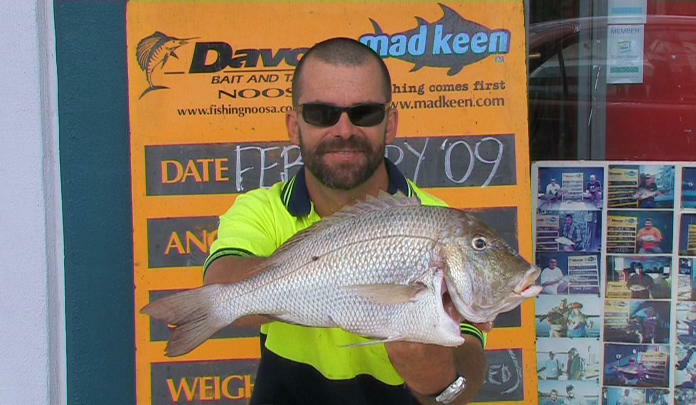 Nuch Howe boated this 8kg Spaniard at Sunshine Reef. Noosa yak angler Billybob Watson trolled up this 7.2kg Spaniard on Sunshine Reef, using a whole bonito for bait. 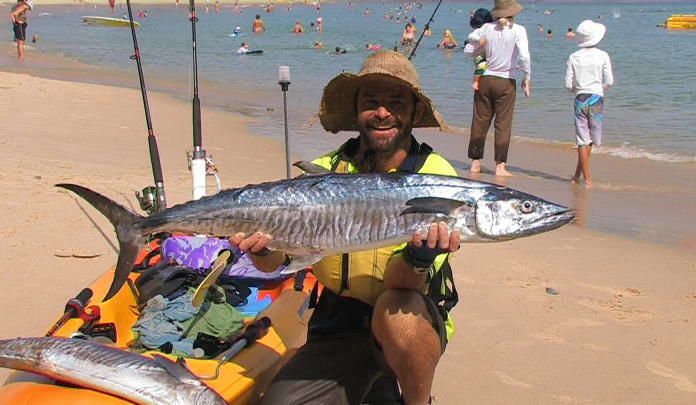 NOOSA: There are plenty of quality spanish mackerel taking troll baits on Sunshine Reef. Dart, whiting, bream and trevally along the Teewah stretch. Mangrove jack from between the lakes, Munna and the Sheraton Bridges. Whiting in the frying pan and in Weyba Creek. Mud crabs along the Tewantin stretch. MAROOCHYDORE: Dart and a few whiting along Mudjimba Beach. Bream to 30cm, flathead and cod around the motorway bridge. Whiting to 32cm between Chambers Island and the river mouth. Tailor to 2.4kg at dusk from the river mouth. A few mud crabs from the middle reaches. KAWANA: Access 32 is producing bream and whiting. Green back tailor overnight along the Currimundi Stretch. Bream, trevally and sand crabs along the La Balsa stretch. Quality whiting from above McKenzie’s Bridge. Jacks from the upper reaches of the Mooloolah and Kawana Waters weir. CALOUNDRA: Quality bream from the Blue Hole. Whiting on poppers opposite the power boat club. 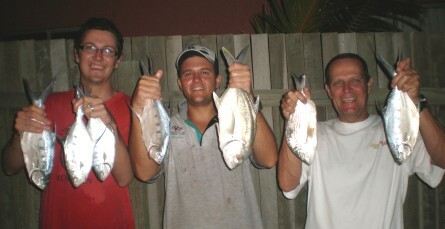 Jacks and trevally from Pelican Waters Canals. Last weekend was indulgent, decadent and incredibly romantic.....for the women! Valentine's Day often turns into a whole weekend of doting (slavery), wooing (speaking Shakespeare constantly) and romantic events (all decisions must be made by the wife, however). Considering the whole world stops for this one date in the calendar and most men are punished if they don't have something booked, planned, delivered or bought for the occasion, I say the following weekend should be about Un-Valentine's Day. A day or whole weekend (if extremely lucky), to be apart from your other half, to do your own thing and be unromantic! I'd choose to go as far away from restaurants and gushy movies as possible - the reefs off Noosa. Now that's my idea of paradise. Rather than telling you around-about where my favourite reefs in Noosa are, the co-ordinates are readily available to punch into the GPS so you absolutely can't miss it. Jew Shoal: 26° 21' 95'' S LONG S 153° 06' 88'' E; in nice and close in Laguna Bay. North Reef: LAT 26° 18' 55'' S LONG S 153° 10' 13'' E; approx. 15 kms N E of Noosa. Chardon's Reef: LAT 26° 25' 25'' S LONG S 153° 13' 67'' E; approx. 15 kms E of Sunshine Beach. Jew Shoal is very close to Noosa itself and is easily accessible from the bar. On a fine flat day you can be out there in under 10 mins with a glorious view of all the tourists sipping coffee in Hastings Street. Keep your eyes peeled for circling birds as Jew Shoal is an ideal spot to pick up baitfish. Trevally, tailor and big snub nosed dart are caught in the surface water on poppers, metal slugs and shallow diving surface lures as well as with bait. During mackerel season this is the spot to be trawling pilchards or bonito strips on a set of gangs. Expect to also catch big cod, snapper and most of the other reefies throughout the year. This is also a great little spot to take your snorkeling or diving gear as the reef is gorgeous on a day with good visibility as there is a huge pinnacle to explore. Be aware that in decent swell there will be a wave-break at Jew Shoal, so gauge the capabilities of your boat before heading out here in the swell. If it is blowy, Jew Shoal is quite sheltered which is an added bonus (unless there's a North-easterly of course). North Reef is a one of the best snapper fishing locations out from Noosa and it produces quality specimens throughout the year, but especially in winter. The fish are constantly on the move and trial and error is needed to track them down. Some of the big snapper have been up to 7kg this year and North Reef is well known as a feeding ground for pearl perch, maori cod, coral trout, yellow tail and black kingfish, large long tail tuna and the odd red emperor as well. It takes around half an hour travel but once you arrive at North Reef, you will have to sound around looking for structure to anchor on. The bottom structure consists of coffee rock, coral reef and weed beds with a depth range between 35 and 45 meters. Most anglers use a dropper rig with a heavy snapper lead that will hold against the current. If you are using burley than it is well worth sending down a whole bait on a set of gangs weighed slightly with a ball sinker that is heavy enough to get your bait down to mid water. The very northern end is called "The Coffee's" because it is made up of coffee rock type reef. The local charter boats regularly have success here. Early morning and late afternoons are the best times to fish North Reef; but when it is on fire it produces quality fish all day long. The main worry is crossing the Noosa Bar during the dark as it is notoriously shallow on low tide, so it pays to cross half tide or higher. Chardon's Reef is east of Noosa and approximately 15km off Sunshine Beach which means you get to take quite a scenic trip around the headland and National Park on your way out. Chardon's averages around 50 meters deep so it is a great spot to target pelagic species. Snapper, pearl perch, trag jew, many cod varieties and scarlet sea perch are common catches. Coral trout also start to show up there in March but currently this a proving to be a top spot for spotty and Spanish mackerel as well as yellowfin tuna on lures. Local charter operators say that Chardon's fires up mostly over winter and the summer is often a great time to target marlin and other top end game fish. Don't always expect to catch fish on your first trip to north as the fish are constantly moving and may take several trips to find them. Noosa Blue Charters (54499355) and Noosa's Laguna Charters (0428 409 628) are good local charter operators that fish these waters on a weekly basis and it is well worth booking a full day trip out with them to learn how they fish these areas and what end of the reef is working at the time. At least you will be enjoying your freedom from the demands of life while away from it all, well at least a few km off the coastline. And nothing beats getting away from the uninviting suggestion from the wife to see that new romantic comedy or to have a candle-lit dinner while she discusses when you need to start thinking about children! NOOSA: Longtail and mac tuna in Laguna Bay yesterday. Good catches of parrot and sweetlip at Sunshine Reef. 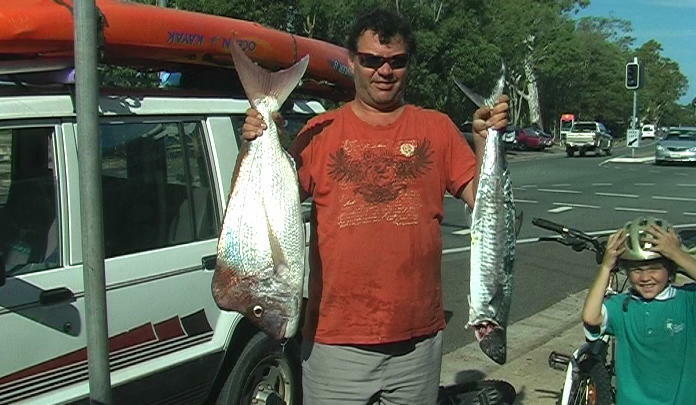 In the river, good whiting on poppers in the top end of the Frying Pan and off Munna Pt. Flathead throughout the lower reaches and a few trevally on poppers in Woods Bay, best one went 3kg at night. MAROOCHYDORE: Whiting up to 550g are feeding in the dirty water between Chambers Island and the Black Banks. A few trevally chasing prawn lures at the river mouth. Grunter bream and bream along the drop-offs near Bli Bli bridge. Mud crabs to 1kg between the cod hole and Bli Bli bridge and up Petrie Creek. KAWANA: Dart, flathead and whiting along Kawana Beach, best between Access 15 and Point Cartwright. Trevally and gar in the lower reaches. 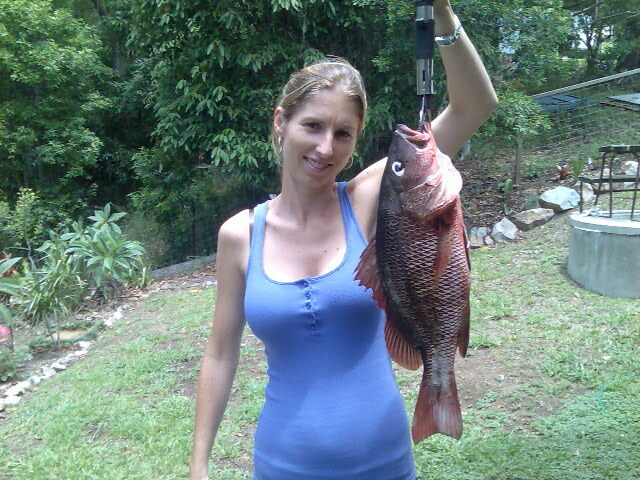 Bream off the rocks walls and a few mangrove jacks near McKenzies Bridge. CALOUNDRA: Trevally and bream in the Pelican Waters Canals. A very nice jack caught yesterday in Bells Creek. Bream and gar off the Boardwalk. Flathead and whiting opposite the Military jetty. 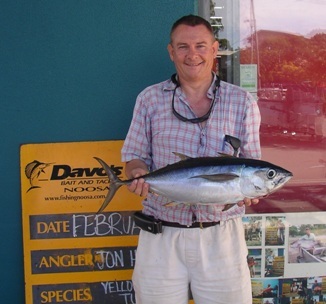 Ian Tagg fished Halls Reef (just north of the Noosa Bar) for this succulent 2kg sweetlip. 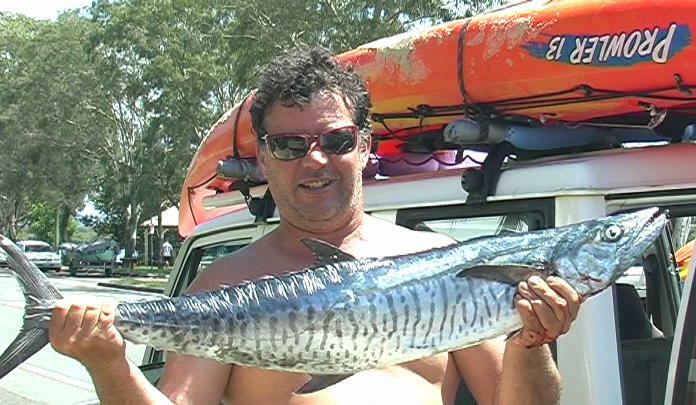 Don struggled to boat this huge 17.5kg spanish mackerel caught while trawling pillies at North Reef. Emily Armstrong with a beautiful mangrove jack caught in the middle reaches of the Maroochy River on live bait overnight.